Always kick off a practice session by warming up your voice for 10 to 20 minutes. Select a vocal exercise that starts in the part of your voice that’s easy to sing. Sing the warm-up exercise softly at first and then gradually increase your volume. Here’s an exercise you can use to get your voice warmed up and ready to practice. It starts lower in your voice and gradually moves up the scale. The exercise lists the word hum because humming (singing a note with your teeth open and your lips closed) is a great way to warm up the voice. Feel free to use this exercise and move higher or lower in your range to help warm up your entire voice. Even if you don’t read music, you can use this exercise as a warm-up because the pattern in the figure sounds like the first three notes of the chorus in “Do-Re-Mi,” the song the children sing with Maria in The Sound of Music by Richard Rodgers and Oscar Hammerstein II. 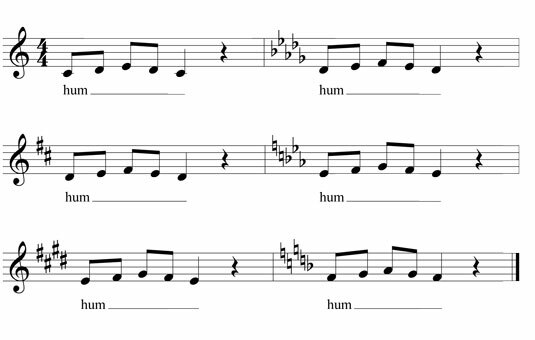 Using the song as a guide, think of the notes in the pattern as using the syllables do-re-mi-re-do.